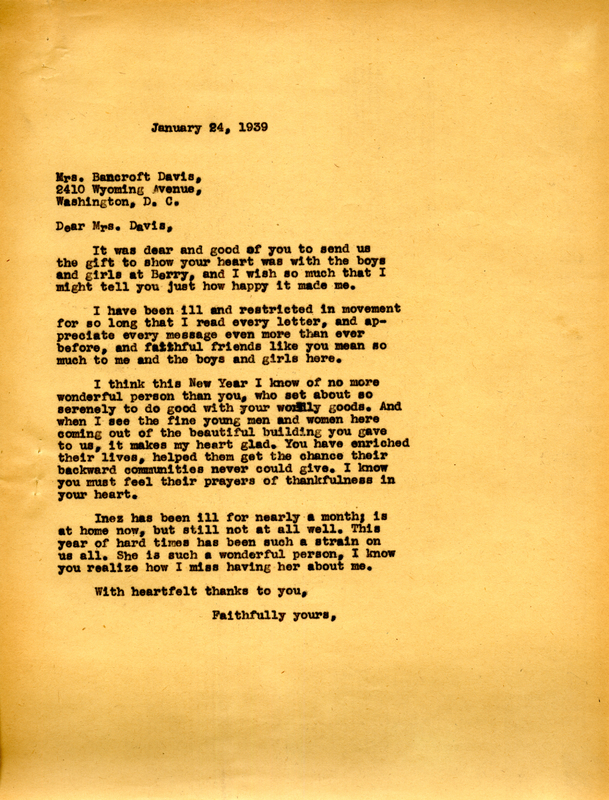 A letter thanking Mrs. Davis for the gift sent to the boys and girls of Berry. She goes on to say that she thinks that she knows no one better than her, and is so thankful every time she sees the building she gave them. She concludes with mentioning that Inez has been ill for nearly a month and how she misses having her around. Miss Martha Berry, “Letter to Mrs. Bancroft Davis from Miss Martha Berry.” Martha Berry Digital Archive. Eds. Schlitz, Stephanie A., Jessica Hornbuckle, Camille Hanner, et al. Mount Berry: Berry College, 2016. accessed April 25, 2019, https://mbda.berry.edu/items/show/14815.